One of the biggest challenges of social media is how to capture and control each separate social media communication, and ensure that each communication is quickly and accurately addressed. SMC4 has comprehensive in-built social media workflow, ensuring inward and outward social media communication follows formal company procedures and processes every time. The SMC4 social media workflow and work basket tools ensure all social media communications remains compliant with company and government regulatory requirements, as well as controlling security requirements and corporate policy mandates. 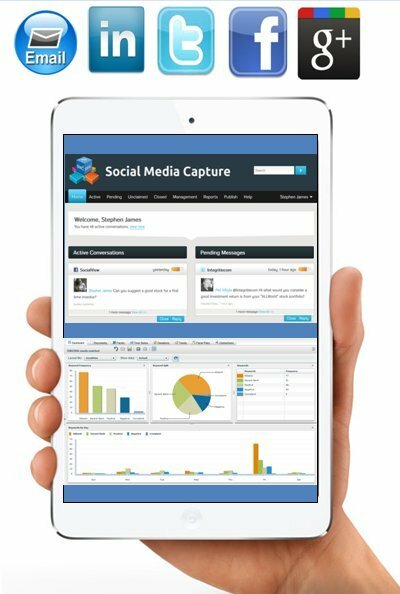 SMC4 captures and places social media communications into automated workflow procedures using advanced case management, ensuring total control of social media speed of response and management of communication policies, compliance and social media governance. Additionally, outbound social media correspondence is audited prior to it ever leaving the company, therefore avoiding potential issues with message content. SMC4 also provides legal discovery that is compliant with electronic discovery standards. SMC4 provides firms with a social media tool to create and manage social media focused policies, as well as the capability to measure the success rate and ROI of social media marketing initiatives. Detailed social media analytics enables financial services firms to compile and mine rich customer analytical data, providing valuable demographic information. SMC4 is affordable and is offered as a turnkey Cloud solution, for easy implementation and low overhead, eliminating the need for in-house IT support.